You may remember that just before Christmas we were given the opportunity to review the fantastic Finding Dory Aquabeads set. My children had a great time creating their favourite Finding Dory characters and so we were delighted to be given the chance to become part of the Aquabeaders group and review some more products from the Aquabeads product range. A couple of days ago we received the Aquabeads Hello Kitty Jewel Fashion Set and my children couldn't wait to get making some more creations to add to their collection. The box was a nice square compact size, and featured a nice clear image on the front of the Hello Kitty case that was enclosed within. There were several images of the creations that could be made along with a young girl posing with the case to help give you a clear understanding of the size of the product. There is also a 3 step picture guide that shows how the product works, as well as some brief written instructions on the right hand side. I really like how Aquabeads add as much information to the packaging as possible to help consumers understand exactly what they are buying and what is included. I believe that this helps buyers to make an informed choice as to whether this would be suitable for their child and if it is something they would enjoy. Inside the box the beads were all wrapped up in their own individual pouch for each colour. I'm not sure if it is just me, but I always struggle to open small plastic packaging like sauces in cafe's etc, and the beads packaging was no different. 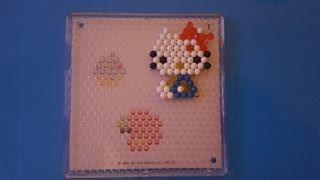 We therefore resorted to good old scissors to cut the bags open and pour the beads into the Hello Kitty bead case. There were more of some bead colours than others and we struggled to fit some of the colours in, but just about managed it. 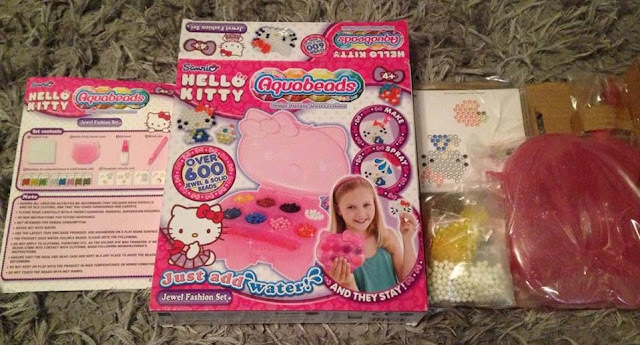 There were two bags of white beads for obvious reasons as this is the most used colour in the Hello Kitty designs and so we kept one bag of white beads unopened in the box for future use, for when the first lot run out. 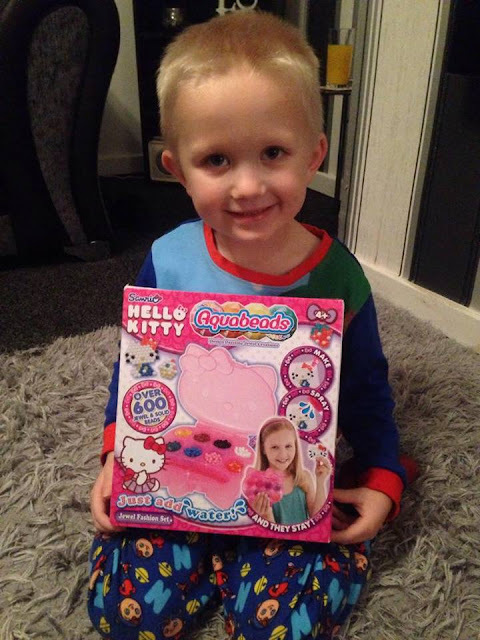 It had originally been my intention to try out this particular set out with my daughter Emma, however my son Riley was with me when this was delivered and then opened the parcel in my absence whilst I was making a coffee and as such, he claimed reviewing rights over Emma to try it out first. He really enjoyed the Finding Dory set we had tried out previously and so he wanted to be the first in the family to try this set too, but agreed that Emma could help him, and could also then have a go after him. (He's not a bad negotiator for a three year old!). Once we had unwrapped all the items, we filled the sprayer with water, selected which template we were going to try first and we were good to go. I found that the sprayer with this set was much easier to use than the one we had received with the Finding Dory set with this one being a pump action spray as opposed to a squeezy one. The set also came with a bead pen, and we found this particularly useful for the tricky bits at the end, or where you only have a couple of beads of a certain colour and it is hard to get them in to place. For the main part of the designs we generally prefer to just use our fingers which is exactly what we did! 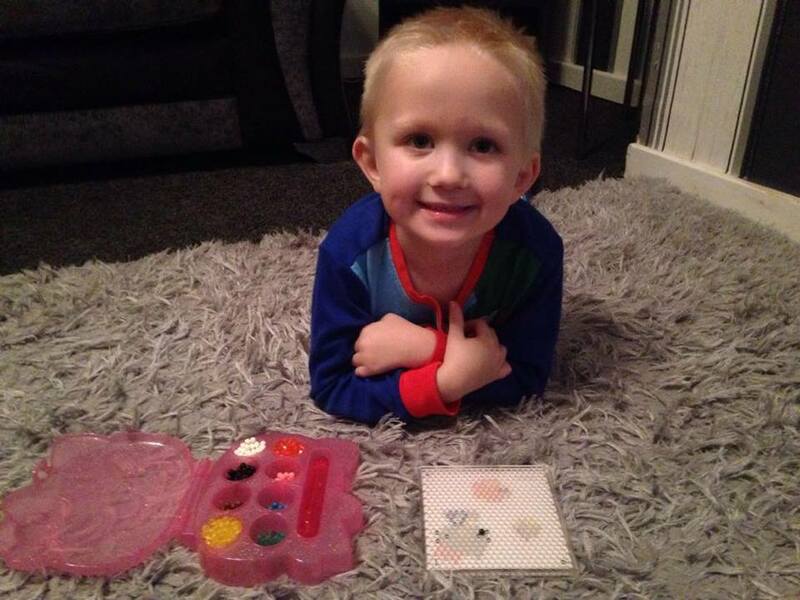 I really enjoy doing this activity with Riley, and love watching him select the right colours and make sure that they are in the right place on the board. It helps to improve hand to eye co-ordination, as well as recognising shapes and colours, and so it is great that something which is so fun and creative, is also a fab learning tool too. After a short while, Riley had finished his Hello Kitty creation, and so he sprayed it all over with the water sprayer and we left it to dry. We had done the activity prior to bedtime as this meant that I could leave it to dry overnight without Riley wanting to check on it every couple of minutes. It also meant that as soon as Riley went to bed, Emma could have a go and complete the apple and cake templates too. In the morning Riley was very excited to check whether his design was ready. He wanted to try and remove it from the board himself, which he did really well until the very last corner where we ended up losing one of the beads from the bow. To be honest, I was actually glad this had happened, as I had read that you could reattach beads easily by simply placing the bead back in the correct area and respraying the water. It therefore provided me with the perfect opportunitity to test this, and so we resprayed the loose bead and left it for an hour. When we returned an hour later, we were pleased to find that the whole design was perfect and stuck all in one piece, and it now has pride of place on Riley's shelf alongside some of his other creations. 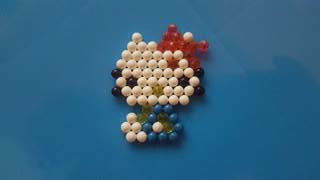 Aquabeads are one of my favourite creative toys, and I really enjoy helping the kids to make their designs. It is a fun activity, that also requires some level of concentration and so it helps to keep my children focused on what they are doing. 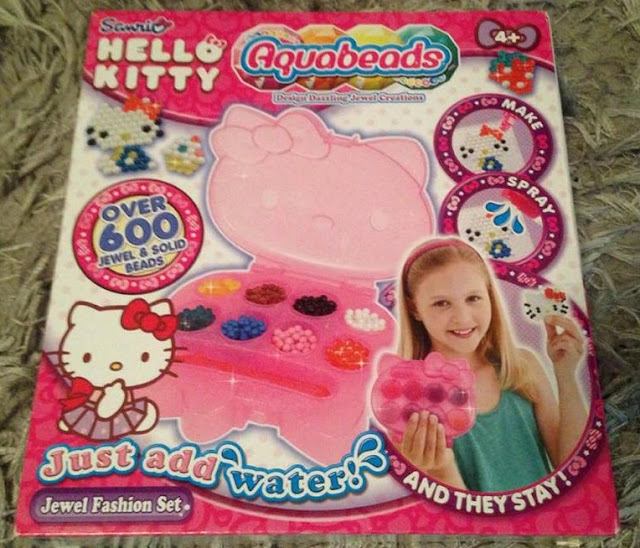 I definitely preferred the water sprayer in this set as it was much easier to use for all of us, and there was a nice range of templates that included some small easy ones that were very quick and easy to do, but also some larger more complex Hello Kitty designs. The case is a lovely pink Hello Kitty shaped design which has a nice appearance and makes an excellent storage box for the beads and pen. This allows you to store the product both neatly and safely. 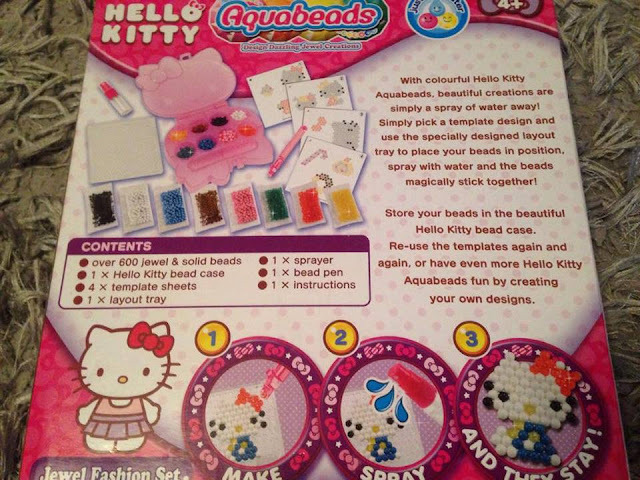 I have been very impressed with both Aquabeads products that we have reviewed and look forward to completing many more creations with my family in the future. Disclaimer: This particular product is recommended for children age 4+ however I allowed my 3 year old son to do this under my supervision. (He will also be 4 in less than a week). I was provided with this product complimentary, in exchange for an honest impartial review. All opinions are my own. Product contains small parts and as such parental supervision is reommended.